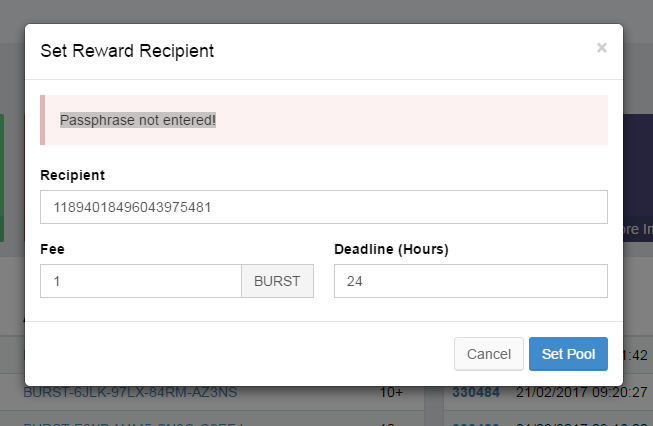 ATTENTION: Just recently surfaced that fee for reward assigment is hardcoded to be 1 BURST, so please do not change fee as it will throw you an error, other than that mod works as intented. That limitation is expected to be removed in next client version. When does it arrive you ask? RewardAssigment what it does? Makes life beautiful and full of joy. thanks @Energy for noticing this! v1.1 - Small fix for ghost unconfirmed transactions that happens during extreme network loads. What happens: Transaction needs to be rebroadcasted and in that time its neither on blockchain nor in unconfirmed tx log so API doesn't see it. It is an amazing mod! Good job @LithStud ! note to self - if script starts throwing errors first check wallet command line screen to see if its dead and not look for errors in code sigh. Great addition, will make life a lot easier for everyone. Perhaps you could add a feature to the Wallet that detects the fee on the current transactions and adjusts your fee to be greater than it? Here's hoping the Weather will improve soon. Thank you so much @LithStud ! This will make life easier for all miner. So for everybody else i have updated the link to download this mod, if you already have it just overwrite files and at the login screen Ctrl+F5 to clear your browsers cache and you can enjoy it again. @Energy oh man something went wrong, moment gonna hop onto my github and check it might nhave been accidently deleted when i updated the source to 1.2.8 wallet (had some conflicts and thought i cought them all).